One of the biggest decisions you will need to make when planning a landscape lighting project is choosing between LED or halogen landscape lighting. Both of these lighting systems provide adequate light along garden pathways through various fixture shapes, but they have a number of different benefits and drawbacks based on their overall design. LED vs Halogen Landscape Lighting What’s Best? To help you determine which option is best for you, here are a few things you need to know before choosing your outdoor lighting. Halogen bulbs lose most of the energy they draw to heat. This is why halogen bulbs can get quite hot and have shorter lifespans. On the other hand, while LED bulbs also produce heat, it is drawn away from the bulb and dissipated by a heat sink, which is one reason LED bulbs last much longer. Halogen bulbs generally last between about 2,000 hours and 5,000 hours; whereas LED bulbs can last up to 40,000 hours. It should be noted, however, that not all LED lights are created equally; older options and LED landscape lighting purchased from big box stores are generally not on par with the fixtures an outdoor lighting professional will provide. Most landscape lighting applications call for warm light with a bit of a yellow hue, which is what you will commonly find with halogens and other incandescent bulbs. The key advantage to LED technology is long-lasting bulbs. Originally designed as an electronic component, LEDs use a tiny amount of electricity compared to traditional bulbs; they survive longer since they do not take the abuse of constant electrical surges like other bulb types. Typically an inexpensive lighting choice, it only requires some yard digging to hide the wires. Because the wires are not high-voltage, you simply hide them just underneath the soil, mainly for aesthetic reasons. If you need to move the lighting around for a landscape redesign, the wires easily lift out of the soil for rapid reorganization. 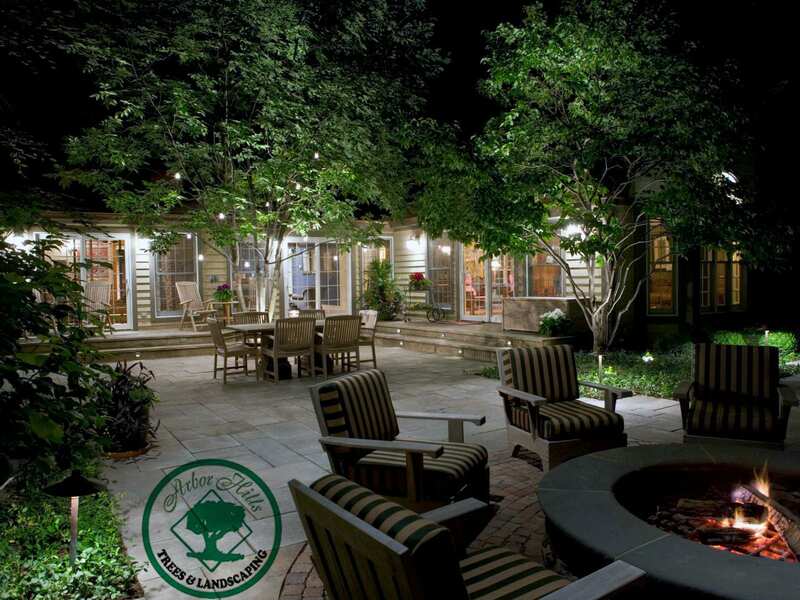 Arbor Hills Trees & Landscaping in Omaha provides high quality Landscape Lighting Systems. We suggest the use of LED lights for longer life and more natural light. We offer design consultation, wire run sizing and a complete line of Kichler Lighting Products to choose from. Up lights, Pathway Lights and Control Boxes all with choice of auto timers.